> Essentially, the government is printing "money" to finance interest payments on its debt. That seems like cheating. Take any model and add an assumption that the government will deliberately debase it's currency and there will be high inflation. The model doesn't matter, inflation will rise. Your model ought to work in a normal world where higher interest rates pushes governments to raise taxes or lower services. Otherwise the high inflation is just the effect of the government trying to sidestep its obligations, not of raising interest rates. I suppose if the government long term plan is to debase, raising rates might force it to happen sooner. In reality most reasonable governments will at least try not to debase too much and do it while also attempting to reduce deficits. This does lead to the Neo-Fisherian outcome. Thanks for these clarifying posts, they are useful. It seems to be that the second strain is pretty much a traditional quantity theoretic description of inflation. It doesn't seem to me to have much to do with the Fisher equation, say like the first strain. The question, to me, seems to be how we assign the direction of causality. Standard quantity theory suggests increasing rate of growth of nominal aggregates increases P (inflation) which then causes an increase in R (nominal rate). The Neo-Fisherian proposition reverses the direction of causality. Increasing R is the cause. Then P must rise (in my view, because fiscal authority accommodates, but in first strain, just by the magic of rational expectations). Why do you use the word 'magic?' (Earlier you write you're not sold on the first strain. )It seems to me that in the first strain, it is the ability of traders to engage in arbitrage that causes P to rise. Arbitrage is a pretty mundane force, I see it all around me. The answer dictated by the logic of arbitrage will always be right, eventually. One other question. In the second strain, what would generate the short initial decline in the inflation rate as displayed in the top chart before inflation starts to rise? The problem I have is how, intuitively, traders in financial markets determined the PCE price-level. It's more intuitive to think of firms setting product prices at the product retail level. Maybe one could rescue the intuition using arbitrage, but it's not so natural for me to think in this way. Perhaps you could give it a try? The initial drop in inflation could be caused by a sticky price friction or segmented markets friction. Within the profession part of the skepticism about the NF view is that many are wed to the Calvo notion of sticky prices. NF doesn't hold there because there never exists a T s.t. all prices in the economy have adjusted. With Calvo a credible promise to keep rates low for 10 years produces immense inflation rates that converge to 2% over the 10 years. There is never that period of time in which the nominal part of the Fisher equation is violated. The best you can get from extending T is hyperinflation. Sometimes models beat common sense. Thanks, Chuck, I did not know that. Can you send me to a link that explains this in greater detail? Why would you assume constant long run money to debt ratio? Does that come out of government budget constraint or am I missing something more obvious? But away from the liquidity trap, suppose the CB keeps M constant while the FA keeps increasing B. Then the money-to-bond ratio goes to zero which, in some models, means ever tightening monetary policy. I wanted to avoid that. Seems to me the constant M/B ratio is doing more than you let on. If the goverment issues long term debt then increasing the growth rate of nominal liabilities then can initially either show up as higher inflation or show up in a lower value of the bonds (higher long term yields). This is from Cochrane I think. The increase in inflation can in principle be put off a long time (if the government issues 30 year bonds then for 30 years). I think your constant money/bond assumption is needed to avoid this (force the government to issue overnight liabilities), but that is not true in reality. The length of time it takes for inflation to increase is the issue here, not the long run validity of the Fisher equation. The initial dip you put in your graphs you said in another comment can be driven by pricing frictions, if that's what causes it then it also means the Fed, over that initial period controls the real interest rate and it also means the initial fall in inflation goes along with a fall in output. If that initial period lasts many years then you can see why someone can think this whole debate pointless, raising rates to raise long in the future inflation is not the goal, keeping near term (or current) inflation near a target is what you want to do. It's true I do not distinguish between short and long debt. Write down your model and let's study its properties. I would disagree with the idea that term debt lengthens the adjustment period. 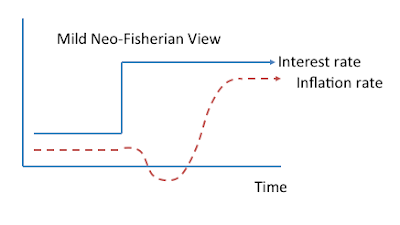 I looked at the inclusion of term debt into John Cochrane's model here - http://monetaryreflections.blogspot.co.uk/2015/11/neo-fisherism-and-term-debt.html. The charts there were based on 25% of public debt by nominal value taking the form of annuities. If we make that 100%, it makes the initial negative impact on GDP and inflation much greater, but it doesn't alter the time taken for the adjustment to happen. The reason (in this model) is that the bigger the initial fall in the value of nominal debt, the bigger the initial deflation, the bigger the reduction in nominal tax revenues, the bigger the nominal deficit, so the faster the flow of new money to households. Ah yes, thanks for reminding me Nick! I happen to imply the second strain of the NF theory. But when we look at the recent data, what does the empirical evidence say? The ECB raised the key policy rate in 2011 (April und July). The Riksbank, Sweden raised the rates in 2010 and 2011. How did the inflation respond? Are there any research based on such current observations? Remember that the proposition offers a *conditional* forecast. As with most propositions in macro, it's difficult to test because so many things are changing at the same time. Yes, Riksbank raised but...how did fiscal policy react? And what other shocks hit the Swedish economy that induced the subsequent cut? This is what makes macro difficult (and interesting). This theory is nice and all but the "higher rates, higher inflation" story rests on the assumption that monetary policy imposes a permanent peg from now until the end of time, or a policy in which the nominal interest rate does not react to inflation sufficiently. If the peg is not permanent but instead eventually responds to inflation at some point between now and the end of time, all these results of "higher rates, higher inflation" go away. Am I the only one who knows this? Perhaps a deficiency in the entire process is that only interest rates are adjusted - essentially meaning a single dimensional control lever on a multi-dimensional problem. The second interpretation is the one that makes more sense. Anyhow, there is still some problema with the intuition. In fact, it seems to me that the mechanism underlying the result Works also in models without non interest bearing money, in which all public liabilities pay interest and there is no transaction friction (so no transaction role of money). Why in the world should in this framework increasing the rate of growth of public debt increase inflation? After all, higher interest rates should reduce private demand. Does it have something to do with public demand (through expenditure of lower taxes/higher transfers)?? David, I know of at least one person who's using this rate increase as an opportunity: as a natural experiment. Thus they've created a quantitative forecast of what will happen. They're forecasting a future trend line in the adjusted monetary base as compared to a counterfactual trendline (i.e. no rate increase yesterday). Do you know of any other people making quantitative forecasts like this? It seems like a wonderful opportunity doesn't it? Tom, no, I do not. But if anyone out there is, I'd be happy to hear from them! David, here's the case I was referring to. The theoretical and mathematical basis is explained in other posts (try the links), but the author will send you the source on request. OK, well I'll check back and see if you get any other responses. I'd love to see other models/forecasts as well. Do you agree it seems like a good natural experiment? Unfortunately, one cannot simply track the path of inflation over the next year or so to test the model's conditional forecast. Even if inflation rises, one cannot conclude that the Neo-Fisherian proposition is correct. Others would, in this case, claim that inflation is rising because the output gap is closing (if growth continues) and that the Fed rate increase was just in anticipation of this event. And so on. "...one cannot simply track the path of inflation over the next year or so to test the model's conditional forecast." But what about the path of the adjusted monetary base (as compared to it's counterfactual trend line)? I am not an economist so I approach this more from a trading standpoint. It seems important, at least to me, that Fisher lived in a gold standard period. Correct me if I'm wrong but on a gold standard rates were hiked to attract capital to a country that was suffering from its lack. Higher rates attracted capital inflows (gold) and to maintain the currency gold peg would have required printing more currency. Would that not be inflationary? Or at least raise NGDP? In today's world that would only be true if Fed and Treasury policy's goal was a stable value for the dollar. If the capital inflows create a rise in the value of the currency - as we have today - then there is no inflation at least immediately. If the increased demand for dollars due to higher - or expected higher - rates was met such that the dollar did not rise, then the result would be inflation. Further, you probably wouldn't get as much of a capital inflow because the dollar wouldn't be expected to rise. Certainly, the opposite is true today; there are speculators buying dollars for the expected profit in the currency not for the piddling rate increase. Finally, even in the situation we have today where an expectation of higher rates has pushed the dollar higher, it seems likely that inflation or NGDP would eventually adjust higher as the capital inflows are invested. Has anyone else worked through the Fishererian implications of gold standard versus floating currency regime? Seems fairly important to me. We don't live in a closed economy. These are good questions, Joe and, to be honest, I don't have any good answers for them. Indeed, the open economy aspects seem like they should be important. The USD and the US treasury are held widely abroad, after all. But I am not aware of anyone who has worked on the Neo-Fisherian proposition in the context of an open economy. If such work exists, perhaps others can alert us. Well, that's a fine how do you do. I come here for answers darn it! I've always wondered about the direction of causation issue. 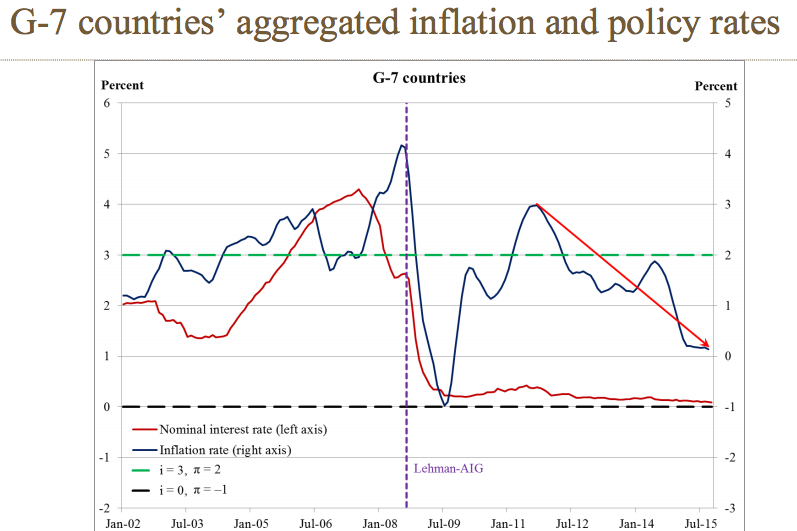 If policy makers are trying to hit an (implicit of explicit) inflation target, then (real and nominal) interest rates will rise as the policy makers come to expect more rapid inflation. With lags (and all that), then wouldn't we expect to see (real and nominal) rates positively correlated with the rate of inflation? How do we dis-entangle this, in a world in which policy is endogenous? We try to disentangle the effects by applying various estimation methods to the data (controlling for several effects). And we try to build models where we can examine the effects of different policies in controlled settings. It's a tough business. 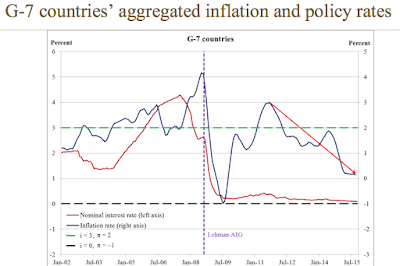 The second strain is reasonable, but the mechanism for inflation in this example seems to result from pushing the fiscal authority to engage in fiscal stimulus, so why not just advocate fiscal stimulus directly? Is there something unique about increased spending on debt servicing costs that makes it desirable?